PA State automobile inspection is the responsibility of any driver operating a vehicle registered in the state. Did you know that you can be cited for an inspection violation for any vehicle you operate whether you own it or not? State inspection is not only a legal requirement, it’s a great way to ensure your safety and the safety of your family. For non-commercial vehicles a State emissions test is also required to verify that your vehicle is nonpolluting (within state guidelines), ensuring a healthy environment for today and the future. Just as you go for a yearly checkup or physical at your local healthcare provider, your automobile needs to be checked by automotive technicians to be certain all of its parts and systems are in safe operating condition – including: brakes, tires, warning lights, windshield wipers and more. Bowe’s Exxon’s service manager and staff of PA certified inspection mechanics are knowledgeable, friendly, fast, and affordable. Our automotive technicians thoroughly inspect your vehicle and create a service report on the actual condition of your vehicle’s systems. Our service manager will contact you before any needed repairs are performed and explain the nature of the service along with an estimated cost. We will also request your approval before starting. Once completed, we apply a current state inspection sticker good for 12 months. Following our recommendations, you can rest assured that your vehicle will provide you with safe and reliable transportation throughout the year. So what are you waiting for? 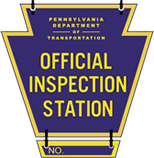 If you are anywhere near Conshohocken, PA schedule your next PA state inspection today. Smart car owners know Bowe’s.